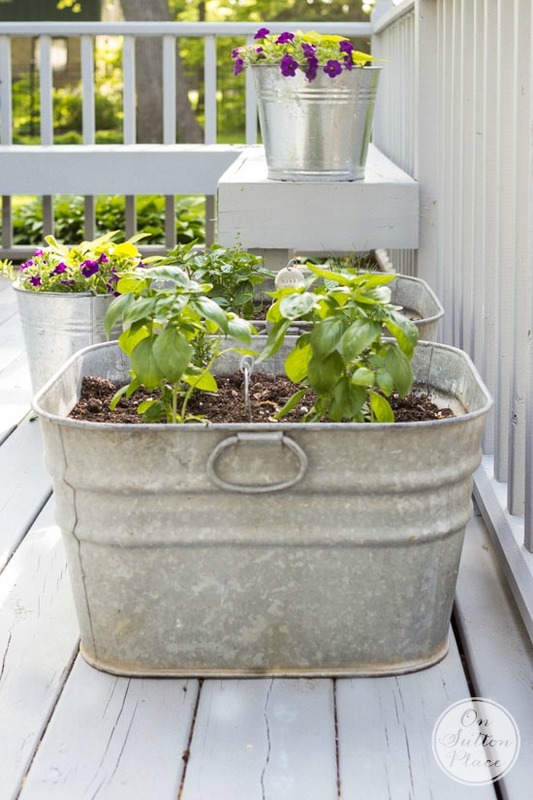 Plant your own vintage galvanized wash tub herb garden. The wash tubs make great containers and are the perfect size for veggies, herbs & flowers. *This post is updated at the end. Hello! This is a really fun post so I’m happy you are here…if you’re as ready as I am for some summer fun then you are definitely in the right place! To start I’m sharing my vintage galvanized wash tub herb garden. First up is my herb garden…and this year I bought my herbs early so I didn’t have to go on the hunt. Last year I was hard pressed to find basil. For the past few years I have tried to plant an herb I’ve never used before. Along with my can’t-do-without basil, mint and rosemary. this year I planted garlic chives and thyme. I’m excited about the chives because I make roasted potatoes a lot in the summer. I usually use rosemary but I think the chives will give them a whole different taste. I’ve already started drinking Mint Lemonade too. Having fresh mint is one of my favorite summer pleasures. Vintage Galvanized Wash Tub Herb Garden: just out your back door! Growing herbs in containers is easy and having them right outside my door is a definite plus. The most important things to remember are to start out with fresh soil and to make sure the containers get plenty of sun. Any type of container will work as long as it’s got drainage. I didn’t want to drill holes in these wash tubs just in case I ever wanted to use them for something else. I used packing pillows in the bottom before I added the soil. You could also use packing peanuts or empty plastic water/soda bottles. I used a couple of vintage buckets (from last year’s herb garden) for sweet potato vine and some little petunias just to add a little color. So…that’s the happy corner of my deck. The other corners aren’t so happy yet but I’m working on it! Update June 2016: We had one of the wettest summers ever in 2015 and after one exceptionally heavy rain my herb gardens overflowed a little. There was no place for all that water to go since the tubs didn’t have any drainage holes. I decided to go ahead a drill one big hole in each corner of each tub. That was ample drainage and they never overflowed again. In a normal year I think the packing pillows would have worked perfectly. I know drilling holes in a vintage container totally deflates the value. I have no plans to sell mine and the reason I purchased them was for container gardening…so the holes didn’t bother me. If you can’t bring yourself to drill holes in your containers (and I totally understand) just be prepared for some overflow! My absolute favorite spot in summer is our patio. It has a pergola over, with a trumpet vine that grows so thick and fast – the blooms are beautiful! It has a clematis vining up one post and the flowers this morning are gorgeous. We put our outdoor furniture set under there, along with a carpet, and have strung up lights. It’s a magical, relaxing place. I love the herb garden….where do you find the wash tubs??? That’s so lovely! I have been wanting to make herb garden and the galvanized pots will definitely give a really nice touch to our porch. Love to plant summer color on my patio. Using succulents is one of my favorite ways to refresh a pot or planter. I love to decorate our garden patio the best. I love to decorate the front porch for all the holidays. Hi Ann….Your herb tubs and back patio corner look great. Looks like you are off to a good start on your herbs. Thanks for being a host of the link party. Fun stuff. 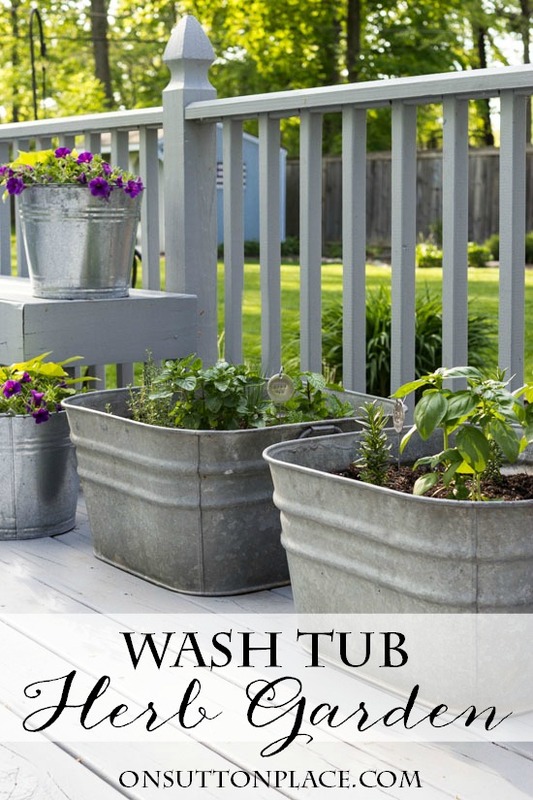 Love your galvanized wash tub herb gardens, Ann. Also saw you have planted sweet potato vines in one of your pails. All the garden experts say that particular plant is easy to grow. So the first time I planted mine, I was sure this would be the STAR of my little balcony. Unfortunately, this star’s light went out almost immediately. I’m sure your sweet potato vines will flourish and be beautiful. Ann, how pretty your herbs look! Very cheerful and nice. I’ll be attempting tomatoes for the first time this year on my postage stamp sized patio- I can’t wait! Thanks for all the inspiration. Ann you had me when I saw those wash tubs and of course herbs just sealed the deal! LOVE it! I also picked up sweet basil early this year as I had the same experience as you. Love your galvanized plantings! I love to decorate our front porch with baskets of flowers, windchimes, sea shell themed lamp and candle holders and new cushions for the chairs and loveseat this year. Last year in Maine I found the sweetest enclosed glass candle holders on 2 1/2 ft metal spikes which get placed in the garden with votives and provide romantic low light. Love your sweet potato vine with petunias and think i will add them to our front porch steps. Be careful with the garlic chives. They reseed like crazy. Luckily, I don’t mind that they’ve spread all over my garden, but be aware that they will! Ann, you know me. I decorate all of my outdoor spaces!!! I just came inside from painting a birdbath blue! Somehow I missed this post, but I’m entering the giveaway! I would spend the $300 on more flowers!!! Love your tubs of herbs! They should do well on your deck! I love to decorate the screened porch where it is protected from the many wonderful creatures that we have in the neighborhood. There is a family of 9 deer that is on our property – they are beautiful but can be destructive when it comes to plants and herbs so I try to keep the herbs I want to use during the summer in my screened porch in a corner where they can get plenty of sun. We also have a red fox or two and other less friendly animals but we love living next to the state park where they all run wild. I’ve been waiting for the spring weather to arrive so I can start summerizing our deck! We live in the mountains but I do a beach theme on the deck….love the patriotic colors too. Very cute herb garden. Have been searching for wash tubs that don’t cost an arm & a leg! I am seriously thinking about do an herb garden like yours. I ave lemon balm in a galvinized tub! I love to decorate the deck with potted herbs, window boxes and hanging baskets! I like my front porch but my back one is so hard to decorate, it’s a long porch and hard to do! Working on decorating my porch of a 100 year old home, glazing window and lots of painting. So happy that the warmer weather is arriving in the midwest! I just planted my herbs last weekend and am very excited to start cooking with fresh herbs. 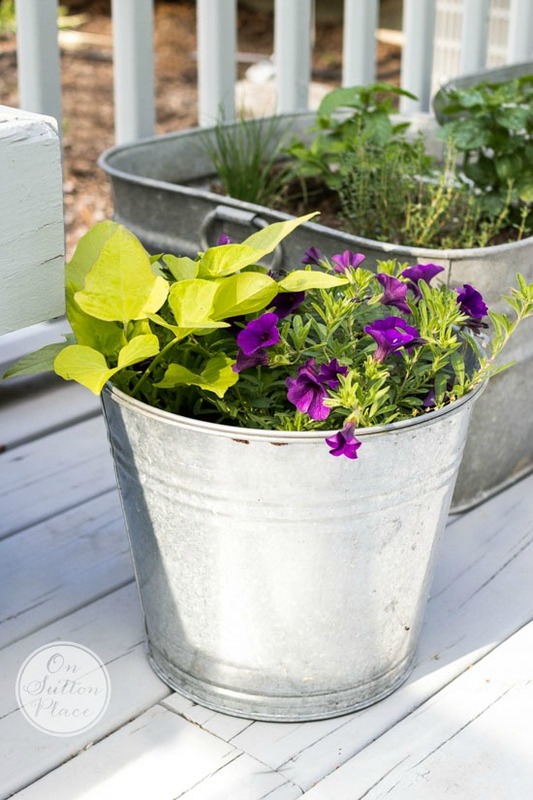 Your galvanized tubs are a great idea! I would like to decorate my patio, there’s so much space and a lot to do with it! I LOVE your wash tub herb garden, great idea!! I love decorating my front porch. It’s small, so it’s easy to add tons of flowers and have it look amazing! Oh I just love those so much Ann!! Such a fabulous idea! I love growing herbs and try to start as early as possible, but sometimes I just don’t make it. For the past two years I have missed out on rosemary. This year I lucked up and got it early. This is the best little outdoor patio garden and I love your tags. Ann, you are a girl after my own heart! I have 2 galvanized wash tubs for herbs too. Your’s look so happy and healthy! I love love love your sweet outdoor garden! Looking forward to adding some color to my patio. I like to decorate our back porch and deck. We spend most of our time out there. I love our enclosed porch. We have a bench that I found at a yard sale for $10 that we refurbished. I hope to add some potted plants and a small table. I love sitting out there in the evenings. It is a great place to read. I have grown herbs for years, mostly in pots on our deck. Just planted pineapple sage. It actually smells like pineapple and has beautiful red flowers in very late summer. I love my porches! One on the front and one on the back! The porch is my favorite-flowers and ferns and a pretty spring wreath make me so happy to come home! My favorite place to decorate in the summer months is the patio. Lots of color. Lots of pots spilling over with blooms. And birds in the birdbath. Such a joy to make it pretty. I am so excited for Summer! This weekend we can hopefully plant our new raised veggie garden. I am also going to buy plants for pots on the front porch. It has become our favorite place to hang out! Love this! I have a galvanized tub herb tower by my back door that I built a few years ago. I’ve used my herbs much more since I located them so close to my kitchen. It’s one of my favorite spots in my garden but I love decorating my screened porch the most. My African violets & other houseplants always spend the summer there. We eat all of our family meals there as well. My new addition this year is an Ozark farm fairy garden (I live in the Ozarks) made in three little wagons all different sizes. Such pretty containers for an herb garden, Ann! I made the mistake a few years ago of not taming the mint in my side yard (it was here when I moved in) and it took over the space. I’m trying to convert all of my herbs to containers now but I think instead of pots I need some of those galvanized tubs. Thanks for the inspiration! I love to work on my patio space with a wall trellis of morning glories, a wall basket of geraniums, and planters of herbs & geraniums. I wish I could grow herbs!!! It’s so easy for most people but here in the Albuquerque, NM area, when it’s hot and windy, they just die!! Even if you water them a couple of times a day, they just burn up, at least in our yard. ours looks just so lovely!! Enjoy them!!!! 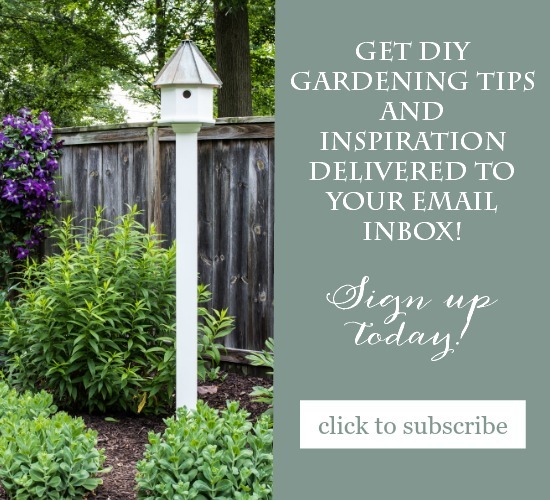 I love using galvanized metal for growing almost anything, I have even used watering troughs and feeders in the past, and I think they look so pretty. They are easy to maintain an no weeds. I’m like you Ann I love mint, but it is so invasive that the best place to grow it is in a container. I decorate my porch and my deck, they are connected. We live in the midwest and haul out all the things every spring, its like getting a new house. I hadn’t thought of using the packing pillows for fill, I usually use plastic water bottles. Gotta start saving those pillows for next year. My favorite out door space is my covered front porch which is approximately 27 ft by 9 ft. I have lots of white wicker furniture and this year my cushions are blue and white and I have used accent colors in yellow and lime green. I make my own wreaths and I change them out according to the season/holiday/occasion. I have a bench that I coordinate with the wreath with pillows, flowers and other objects. My porch has lots of plants and it is also the haven to my cat Sandy. Looks great Ann! I also have these buckets! Love them! I also use large horse troughs on my farm for flowers! I recently planted yellow daisys in my tub !Very country! I love your herb garden! I’ve been wanting to do this and I love the idea of the wash tub! Thanks for your inspiration! Love the wash tubs, I think you bring them to the cabin, LOL. Beautiful Ann! I love herbs on a deck! What a great idea to use packing pillows! You’re so clever Ann!!! I love how you used the wash tubs – such a pretty patina! Happy Summer Ann – thanks for partying with me! So cute! Where did you get the metal herb name sticks from? I have an herb garden on my side porch also. Thanks for the chance of the giveaway. I’ve just finished looking at all the blogs…oh, so much inspiration! I have a front porch and a covered deck and have loved decorating both. You can never have too many outdoor sitting areas. We find we move around and sit in different areas at different times of day. It’so nice to view your out-of-doors from different perspectives. Thank you for so many great ideas. My front porch is my favorite place to decorate – any season. Great post Ann. Love those herbs. I do the same with all of my big pots,only I use some of our recyclebels. I save plastic milk jugs,deli containers,any plastics that I would normally put in our recycle bin. Wash them, and put them in the bottom of my pots. Allows for drainage, and on my huge pots I am not using so much of the expensive potting soil. I am sure your place is looking beautiful now. Happy Memorial Day weekend! I bought the herb markers last year. Love them. Now I’m on the hunt for those galvanized tubs. Thank you Ann for your inspirations indoor and outdoors. Bring on summer. Lovely herb garden! Truly enjoy your blog, thank you for all your tutorials, ideas, recipes, an inspiration! Thanks for the chance to win some Paypal cash! Would be thrilled to spoil my family! Like usual, I love your idea!!! I have one tub and it is shallow, but it would work, so I’m off to buy herbs!!! I’m glad to see you also use “stuff”(packing peanuts, etc) to take up space and add drainage to your containers. My hubby thought I was crazy! Why didn’t I think of this?! Easy, functional, AND beautiful. The area around my pool. It’s where we spend most of our time. Love this post, the galvanized buckets are very trendy and having all the herbs organized before summer is wonderful! My porch is my favorite spot to decorate up to this point…but your post entices me to venture off of the porch into the patio area. I use plastic soda bottles in the bottom of my large pots. Love your post, Ann! Love your idea for the herb garden!! The galvanized containers look so nice. 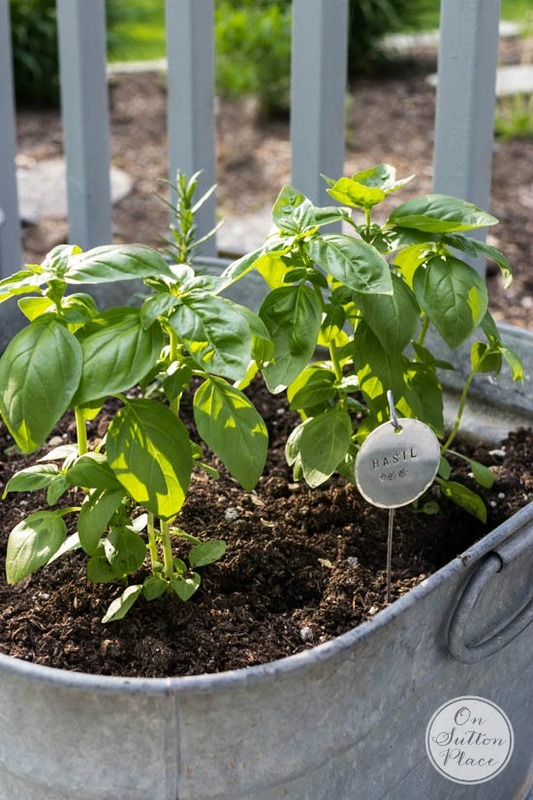 Ann, what a great idea to use the galvanized tubs and air pillows for your herb garden! And I love the little id tags too! And, like you, I like to look for little ways to dress up my outdoor areas for summer; and I especially enjoy “opening up” my screened porch. That’s a great idea to use up those packing pillows. Thanks for the giveaway! Love your galvanized herb garden! What a great idea. I plant my herbs each year in a tiered planter, but next year I think I will use your idea. I have several galvanized buckets. My favorite outdoor place to decorate is my deck/patio area. We have a built in outdoor pizza oven so we entertain out there a lot. 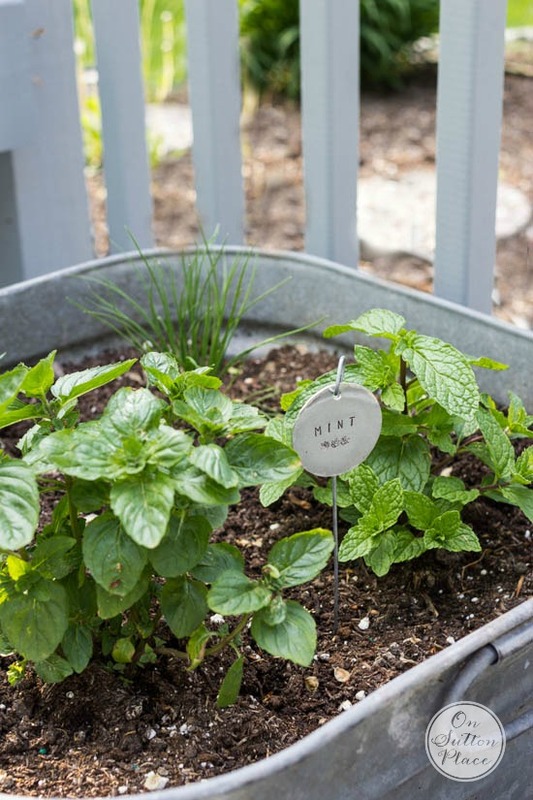 Love your herb garden – my thumb is not very green but going to give this a try! Will put on small patio right outside my screened in porch did already by a fairly established tomato so fingers crossed on some additional herbs. I love the idea of using buckets to plant herbs in! I am crazy about anything in galvanized buckets! 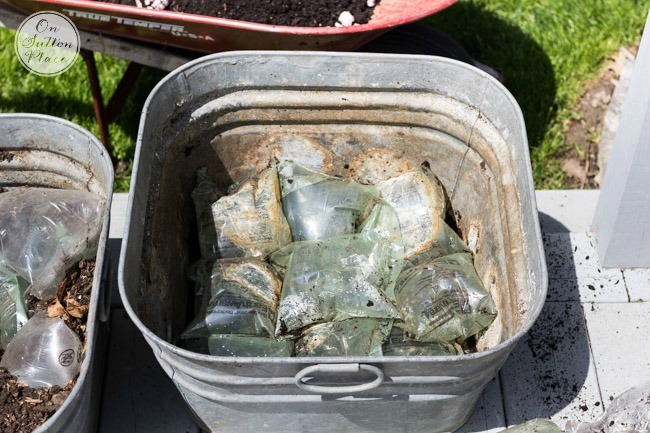 The packing bags are a great idea for drainage. Love the galvanized tubs! interesting about the packing pillows. are you saying that when you use them you don’t have to have drainage holes? I love that idea. Love this idea and basil is my favorite herb also! Love your washtubs!! I haven’t planted yet since it has been cool and rainy. My son built me cedar planters for my patio and we plant herbs in them. gardening is such a rewarding hobby. Thanks for sharing. This truly is a happy space. Great work! i love using galvanized garden containers. It seems a perfect fit with your herbs and smart, too, to keep them elevated in case cats or dogs want to mark their territory! Love the tubs and using the pillows for drainage. Brilliant!! Thanks for the inspiration! Love your galvanized herb garden. I just did some herbs myself yesterday. I agree with the other posts. Light Bulb time! Knew about packing peanuts but didn’t even think about the air pillows (and I already save them for Christmas packages). I love herbs, too and galvanized wash tubs. Really enjoy your blog! I have a small covered porch off my kitchen that I love to decorate in the summer. I just wish it was a little bigger. Using air pillows as a filler in large containers is brillant!! I too plant some herbs and I agree that you can’t wait too long to purchase them or they’re gone! It’s like a light bulb just came on – using air pillows instead of stones for the drainage! Ann, you always have the best blog!